I love makeup and when I find something good, I have to share it. Normally, I'm a shimmery lip gloss kind of girl, which is great for spring and summer. As winter approaches, I like to make subtle changes to my makeup routine. It usually involves changing the color of my blush, eyeshadow and/or lip color to warmer hues. I've been searching for the perfect "reddish/brown/just-a-few-shades-darker-than-my-normal-lip-color" lipstick. After trying out what seemed liked hundreds of brands and colors, I found THE perfect shade. 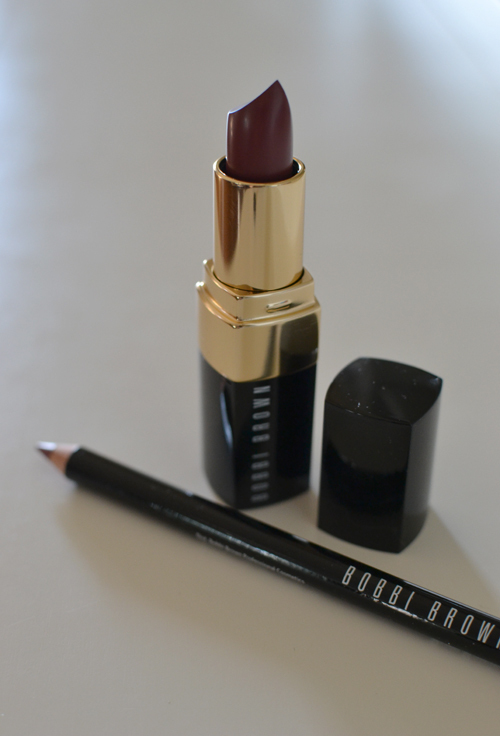 Bobbi Brown's "Rum Raisin" lipstick and lip liner. The shade is EXACTLY what I've been looking for. The color is natural and flattering, without being too red or making me look like a vampire (I'm not really into the whole "vampy lip" thing), and glides on velvety smooth. What kinds of changes do you make to your makeup routine as winter approaches? Any must have products I should know about? Love this color for fall / winter! I also need to update my lip colors for the cold weather....& this is a perfect recommendation Audrey!